This is another fun post, as I am currently working on a free Premium WordPress Theme for all to download. Anyway, I found this website Speedtest that will track how fast you type. Lets have a fun challenge lets see what you get. 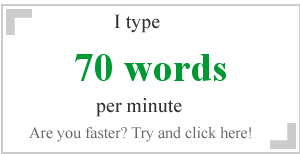 Comment below your Words per Minute. @Edwin thats pretty cool. What is your main language. This post really opened my eyes.